Sen. Bernie Sanders, president of the South Carolina NAACP chapter, Brenda Murphy, and Sen. Cory Booker march in commemoration of Martin Luther King Jr. Day in Columbia, South Carolina. The basic theory of the presidential candidacy of Sen. Amy Klobuchar of Minnesota and the potential candidacy of former Vice President Joe Biden is that Democrats win when they are able to get the electorate, particularly Midwestern white voters without college degrees, thinking about economic issues and not cultural or racial ones. Lots of left-leaning commentators favor something like this strategy — “It’s the populism, stupid,” New York Times columnist David Leonhardt wrote a few months ago. Other Democratic 2020 candidates, such as Bernie Sanders, are also hinting at this approach. The case for Democrats both running on populism and centering their electoral strategy around appealing to Midwestern white voters without college degrees is fairly strong. After all, polls show that voters are more aligned with the Democrats on some high-profile economic issues than on some hot-button cultural ones. Recent electoral history also seems to make this case. Then-President Barack Obama leaned heavily into economic populism during his successful 2012 re-election bid, when he won states including Michigan, Pennsylvania and Wisconsin. Hillary Clinton lost those three states and the election in 2016 after a campaign in which both she and President Trump spoke bluntly about issues around race and identity. In turn, Democratic congressional leaders emphasized a pocketbook message for the 2018 midterms, and the party’s candidates executed it, highlighting health care, particularly the GOP push to repeal Obamacare, more than perhaps any other issue. And the Democrats made huge gains in November. 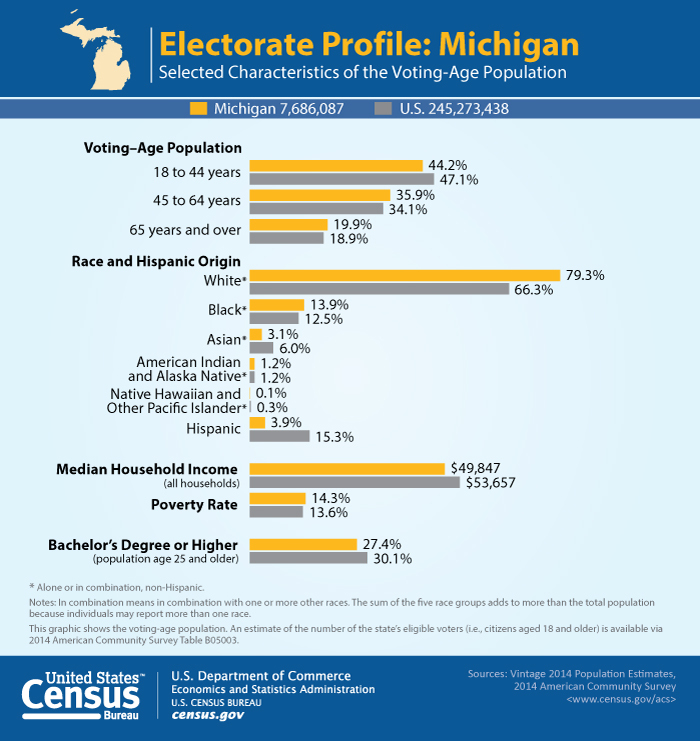 Looking ahead to 2020, the easiest, clearest path for the Democrats to get 270 electoral votes is for them to win Michigan, Pennsylvania and Wisconsin, and all three states’ electorates have a higher percentage of whites without college degrees and a lower percentage of people of color than the nation overall. And those three states have already shown signs of bouncing back toward Democrats — the party won the governor’s race in all three in November. Many Democratic politicians and strategists view the party’s 2016 collapse with Midwestern white voters without degrees as largely the fault of Clinton, arguing that she talked about issues other than economics too much. But some research shows that that’s not quite right. In their book “Identity Crisis,” political scientists John Sides, Michael Tesler and Lynn Vavreck described how non-college-educated white voters who had more conservative views on racial issues had been leaving the Democratic Party throughout Obama’s presidency. Clinton didn’t create the Democrats’ problem with non-college-educated white voters. She inherited it and failed to reverse it. The way Clinton ran in 2016 — invoking terms like the “privilege” of white Americans and embracing the Black Lives Matter movement — might have exacerbated the shift of racially conservative white voters away from the Democratic Party. But Trump was likely the bigger cause, according to Ashley Jardina, a political science professor at Duke University and author of the new book “White Identity Politics.” According to Jardina’s research, Trump, with his anti-immigration and anti-Muslim stands, tapped into white Americans’ identity as white people in a way previous Republican presidential candidates did not. In other words, the key difference between 2012 and 2016, per Jardina’s findings, was not really that Clinton ran a campaign with less economic populism and more talk about race. Rather, “Trump drew in certain white voters who were especially concerned about protecting their racial group and its interests,” Jardina said. Looking forward to 2020, the Democratic presidential candidate probably can’t avoid an election where issues like immigration are at the forefront, since Trump is running and he loves talking about them. According to these experts, the Obama-Trump voters were about 84 percent white, as you might have expected. But those who stayed home were about equally divided between white and nonwhite, and the third-party voter group was about 70 percent white. And those who didn’t vote at all in 2016 had more liberal views on policy issues than the Obama-Trump bloc. And even outside of one-time Obama voters, there’s a case that Democrats can win more nonwhite voters and racially-liberal whites without really sacrificing any white votes that might be available to the party. Christopher Stout, a political science professor at Oregon State University, argues, using survey research, that black and Latino voters have both become more aware of racism and more conscious of being part of minority groups since around 2014, in part because of movements like Black Lives Matter. During that same period, according to Stout, white voters have become more sorted according to their racial views — so white Democrats are liberal on racial issues and white conservatives are conservative on racial issues too. In Stout’s view, there is little downside for Democrats in talking about fighting racial inequality because people bothered by that kind of talk are already Republicans. But there is a potential plus in this strategy. According to Stout’s research, a candidate advocating for criminal justice reform, granting legal status to undocumented immigrants and making it easier to vote (he tested these three policy stances specifically) would increase voter turnout among people of color. “Current political contexts make positive racial appeals a necessary component of any successful strategy for left-leaning candidates,” Stout told me. And electorally, this kind of approach, with a focus on whites with college degrees (who tend to be more liberal) and nonwhite people of all kinds, might align better with where the U.S. electorate is headed. Michigan, Pennsylvania and Wisconsin are probably the most important swing states for both parties in 2020, since they were so close in 2016 (Trump won all three by less than 1 percentage point). But after those three, the 2016 and 2018 results suggest Democrats have as good a chance of winning in Arizona, Georgia and Texas (places with fairly high nonwhite populations) as in Iowa or Ohio. The latter two are traditionally considered battleground states, but the Democrats are really struggling in both as of late. Congressional Democratic leaders decided fairly early in the 2018 election cycle in 2017 that the party should run on health care and other pocketbook issues in the 2018 midterms. So unsurprisingly, Democratic leaders on Capitol Hill are now arguing that their health care strategy was central to the party’s victory in 2018. I’m skeptical. Trump’s approval numbers did drop a bit in early 2017, amid his party’s push to repeal Obamacare. But the Obamacare repeal push ended in September 2017. What was Trump doing for the next 14 months before the election? I would argue that the issue he was most focused on, particularly in 2018, was immigration — making headlines both for his policies (separating immigrant children from their families at the border) and rhetoric (“shithole countries”). The year leading up to the midterms was full of Trump doing and saying controversial things on a number of issues, but not really on health care. The biggest reason Democrats won the House in 2018 was huge turnout among anti-Trump voters. Some of the Democrats’ strongest candidates, in terms of doing better than the state’s partisanship suggest they should, including Georgia’s Stacey Abrams and Texas’s O’Rourke, cast themselves as liberal on cultural issues as well as on economic ones. The data suggests that in 2018, Democrats didn’t just make gains in the Midwest with one specific strategy, like economic populism and appealing to white voters without degrees, but rather that Democratic candidates with all kinds of different messages did pretty well across the country and with almost all voting demographics (compared to 2016) because they were running against Trump and the Republicans. Looking forward to 2020, Democrats may not want to assume that the general dynamics of the 2016 election — the Electoral College is closely divided and the candidate who wins Obama-Trump voters in Michigan, Pennsylvania and Wisconsin will be elected president — will remain in place. “After every election, the losing party is told that it needs to rectify the alleged mistakes of that election in order to win the next election,” said Sides, one of the co-authors of “Identity Crisis.” “Usually this means winning over some supposedly crucial group of voters. How exactly might 2020’s electorate be divided differently than 2016’s? Well, the data experts who researched Obama-Trump voters say that 2020 could see an increase in the number of people who voted for Mitt Romney in 2012 who then defect to Democrats, as well as an increase in Republicans under 40 who backed both Romney and Trump but are now leaving the party. They argue these blocs in particular don’t align with Trump on immigration and trade. I’m making a case here, and it’s purposefully a bit provocative. The clearest way for Democrats to win in 2020 is for the party to carry Michigan, Pennsylvania and Wisconsin — three states that have lots of white voters without college degrees and where Trump’s tax and health care plans are very unpopular. Perhaps Democrats aren’t disciplined enough to talk about race and identity without also talking about related issues (reparations, for example) that may turn off swing voters. Maybe voters will actually hate legalizing pot or ending the death penalty once they think more carefully about it. Maybe white voters in the Midwest will keep getting more Republican, and 2018 will prove to be an aberration. Maybe some of them were turned off by Obama and Clinton’s identities, and the real issue is not that Democrats are culturally liberal in policy but in persona, and that presidential candidates like Booker, Gillibrand, Harris and Warren are doomed in the Midwest. So I’m not sure that this kind of non-economic liberalism is the best strategy for Democrats. But I’m not sure it isn’t either. To be clear, the scholars who wrote the CAP report also argued that Clinton would have won those four states plus Iowa if she had done as well among white workers without degrees as Obama did.